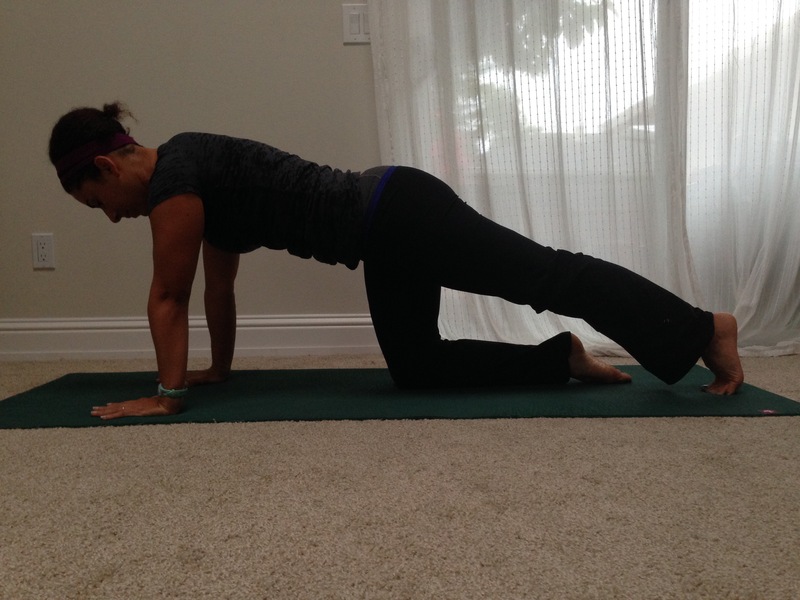 Today’s pose, spinal balance, is one that takes core strength in the back muscles as well as the front for stability. Spinal balance, dandayamna bharmasana in Sanskrit, is also known as balancing table in some yoga circles. It’s often called a beginner’s pose, but in my experience, it takes a lot of body awareness and control to execute and can be a challenge to hold. 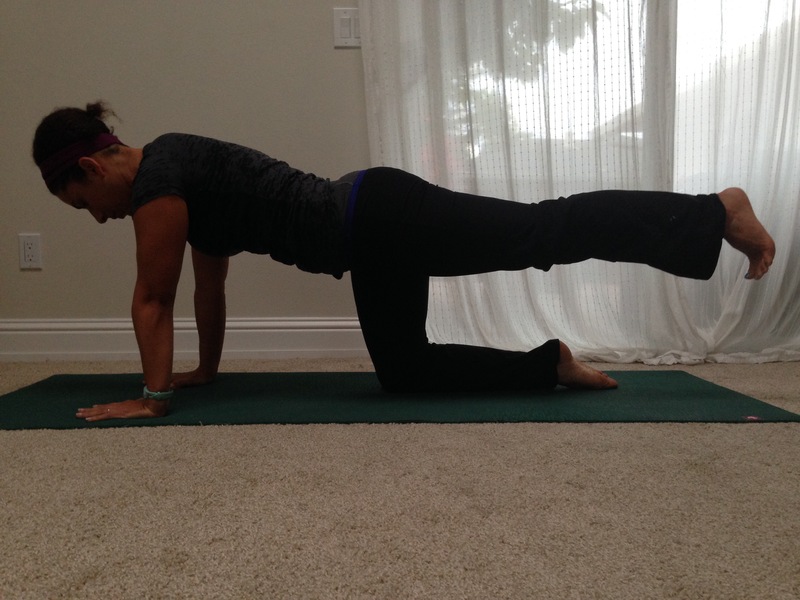 I love using it as a warm-up, because it helps you get a feel for elongating your body while connecting to your core. In my classes I often incorporate it into a flow to get the breath linked to movement. But today, we are going to break down this pose and get into proper alignment for optimum benefit. From hands and knees (use a blanket or a doubled-up mat under your knees if they’re sensitive), bring your belly button in towards your spine to firm your abs and flatten your back. Keep your gaze at the ground and draw your shoulders away from your ears for length in your neck. 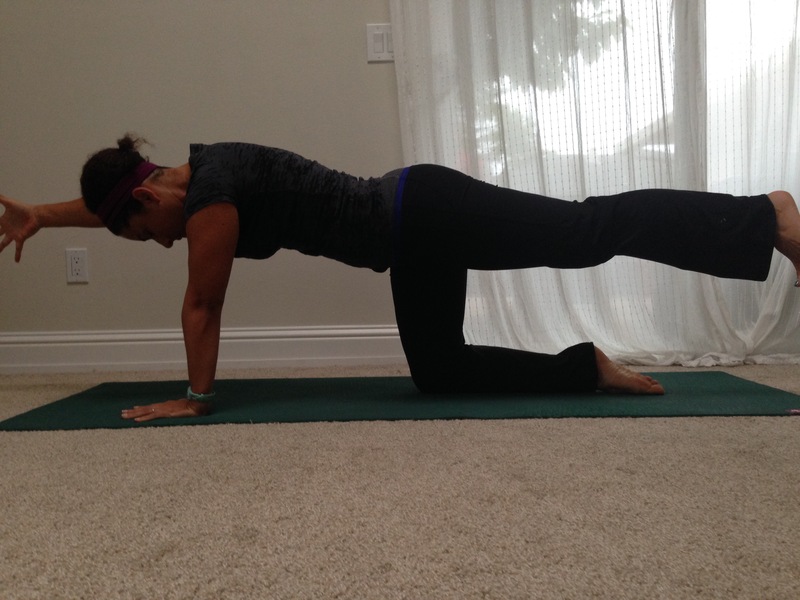 Extend your left leg behind you, keeping toes on the ground. Press through your heel to strengthen your thigh and feel strong from hip to heel. Inhale, lift your leg to hip height. Extend your right arm forward, turning your palm to face in, your thumb to the sky. Work to keep your hips level and your abs turned on as you breathe. Hold for three to five breaths. Switch sides. Lift your leg only, not your arm if you feel unstable or wobbly. Work on your balance and strength from here. If your wrists bother you, use fists for wrists or come to your forearms. Try to keep your leg at hip level. Keep your core muscles engaged to support your back and keep it flat. Lift your arm just to shoulder height. Think about reaching out and back, creating length rather than height. Keep your gaze at the ground, your neck long. It can be helpful to have someone watch you and tell you when you are in proper alignment or to do this in front of a full-length mirror, though you may know my thoughts on mirrors and yoga. As always, let me know if you have any questions, if anything’s not clear or if you just want to say hi! Have a great time with this one. Come see me in class today at 9 a.m. and 4:30 p.m.! Posted in Benefits of Yoga, Pose Breakdown, Summer of Core and tagged Abdominals, abs, alignment, asana, Awareness, balance, Benefits, Benefits of Yoga, core, Crosstraining, hip flexor, Hips, Injury Prevention, Legs, Mind and Body, Pose Breakdown, Practice, quadriceps, Recovery, Shoulders, spinal balance, strength, stretching, Strong, Summer of Core, thighs. Bookmark the permalink.